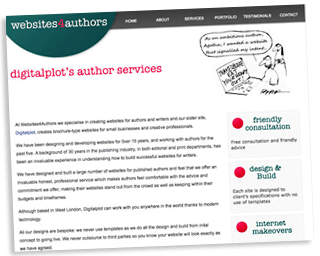 At Digitalplot we specialise in creating websites for authors and writers. A background of 30 years in the publishing industry, in both editorial and print departments, has been an invaluable experience in understanding how to build successful websites for writers. We have designed and built over 32 websites for published authors and feel that we offer an invaluable honest, professional service which makes authors feel comfortable with the advice and commitment we offer, making their websites stand out from the crowd as well as keeping within their budgets and timeframes. Although based in West London, Digitalplot can work with you anywhere in the world thanks to modern technology. All our designs are bespoke: we never use templates as we do all the design and build from initial concept to going live. We never outsource to third parties so you know your website will look exactly as we have agreed. Digitalplot is recommended by several authors who are members of the Society of Authors and receive a lot of enquiries from that source. All our Authors services and portfolio can now be found on the new web site Websites4Authors.